We have to wait until September?? C A N ' T H A N D L E T H E L O N G W A I T !!! That sounds awesome, though the article says the book is gonna be for ages 8-12, so will it be unsuited for late-teens and adults or are all books (Harry Potter and Maze Runner) all described that way? I'm so giddy happy for you! Go, James! Cool! I can't wait to read it! Fantastic, James! Couldn't be happier for you! I cant wait for see the first book! I hope that you decide to read this comment. You're a great writer and I enjoy your books. Just wanted to let you know that I have loved your Maze Runner series since the beginning and finished the final book a mere 15 minutes ago. I also wanted to let you know that The Death Cure had the single worst ending of any book that I have ever read. Really, all of humanity is doomed except for one small group? You never find out why Teresa said what she said and did what she did? WHY?! I love how you always manage to surprise your readers, but that apocalypic ending was just going too far. I wasted hours of my life reading your series. And no, your coming prequels will not satisfy my hunger for another ending. Although at least I'll be able to find out more about Thomas' past (I hope)I won't find out what happens to all the people who enivitably catch The Flare. The only way you could ever redeem yourself in my eyes is by writing at least one more Maze Runner book with a better conclusion. There must be some way to find a cure for The Flare; you can't end a book series with only several people left to re-populate the planet in a so-called safe haven. And what about the remainder of WICKED? Do you really expect the readers to believe that WICKED members just believe what thier leader says and forget the trials and forget about searching for the cure? Well, we DON'T believe it! I am so angry right now that I am shaking. That's so cool! I'm excited for you. And to think I knew you when . . . Sounds fantastic, James! Can't wait to check it out! James dashner! 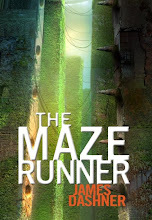 I love the maze runner series! I was just looking for another book in the lirary. When I first saw the book, I didnt know it was going to be sooooooo GOOD! bEALIVE IT OR NOT. Once the book came to the ibrary I ran out of my computer seat, being the first one to get it! "Talking about The death cure" I was really upset when newt died, but he begged so wasnt that upsetting. Then the last 3 paged Teresa dies! I was soooooo upset! You should really write a diff series about them... but you should make teresa some how come back to life. I know the paige person could of saved her! Yah But i agree with the dude that wrote to you about the same thing you really should. But thats not all theirs a movie on the maze runner next year! Am soo excited! Ok BYE!